These three items appeared separately in the original version of the Around Naples Encyclopedia on the dates indicated and have been consolidated onto a single page here. The only two cities in Italy with extravagant Rio–or New Orleans–like activities for carnevale are Viareggio—on the western coast of Italy as you move up the Ligurian coast past Livorno (quaintly known in English as "Leghorn") on the way to Genoa—and, of course, Venice. The only festival of that nature in Naples, I think, is the Festival of Piedigrotta on Sept. 8 and 9. I say "is," though "used to be" would be more like it. I don't recall ever seeing anything more than a perfunctory fireworks display, a far cry from the mile-long parade of floats, bands and outlandish bedizenment wending its way along the seaside public gardens to the Church of Piedigrotta years—decades—ago. The city keeps promising to revive it. Who knows. So, today, there were a few city-sponsored festivities around town, but nothing much. We wished for you intensely, my beloved Nina and I. We had no son, but you were born lifeless, and your dear mother died, as well, giving birth to you, leaving me with five tender little girls. I remember being struck by the enormity of it: this poor women had died trying to make up for her "failures" in producing nothing but girls. Her husband just had to have a son. It also reminded me of when I got married and moved to Naples. A young woman from a small town near Naples found out I was newly wed and said to me, "auguri e figli maschi"—"best wishes and male children". She was sincere, but it was one of those phrases that is well-rehearsed through practice, the traditional thing to say to newly-weds. Today, it has an olden ring to it, or at least it embodies the values of small southern towns, one of which values is (or was) the large family—preferably with a lot of strong male hands for farming. Having said that, it seems to me that whenever I pass through one of those places, I see an awful lot of women out working in the fields, or balancing heavy bundles on their heads as they walk along the roadside, or leading animals to pasture, so I'm not sure what all those strong male hands actually do. Maybe they're for wielding the traditional lupara—shotgun—though, again, I imagine women can be pretty good at that, too. I see in the papers that 55.000 people have showed up in Venice for the beginning of carnevale, a celebration that will run through next Tuesday, Mardi Gras. How can this be?—I ask myself. Did I not identify last Tuesday, February 18, as Mardi Gras on the basis of seeing two young children parading around in pirate costumes? Indeed. There must be some mistake. Perhaps I was thinking in a different calendar. The Coptic Christian calendar, perhaps? That might be a way out, I think. I don't know, however, that there are many Copts in Naples. On the other hand, I do often walk by a small private club called the "Circolo Mare Rosso" (The Red Sea Club). Beneath that inscription is the equivalent name, written in a very strange alphabet that seems to be full of pitchforks and dyslexic versions of the letter J. Yes! That must be Coptic, the end-stage of ancient Egyptian, and now the liturgical language of a strong minority of Christians in Egypt, an overwhelmingly Moslem nation. I have somehow—just by walking by the place—picked up on their early celebration of the week before the beginning of Lent. I rush down to check it out. Oops. The sign proves to be in the Amharic language, written in what is called Ethiopian script, a derivation of the old Arabic alphabet. It really looks nothing like the Coptic script, I have to admit. Hmmm. Maybe I was thinking in the Neapolitan Revolutionary calendar from way back in 1799 when Neapolitan revolutionaries redid the entire calendar after the fashion of Revolutionary France: January was called "Rainy". I think February was called "Foggy". I am not sure of that one, but the potential for confusion with the Seven Dwarfs is obvious and certainly could have been no source of strength to the Republic. Besides, they were anti-clerical, so I don't suppose reactionary Christian holidays were even recognized in the calendar. That, too, is out. It can't be the Greek Orthodox calendar, because I don't know anything about that one, except that it uses the Julian Calendar instead of the Gregorian Calendar to calculate Easter, and, after dividing the vernal equinox by pi, they are bound to be a week or two off, just like me. I may just have to step up and forthrightly take responsibility for myself and blame my miscalculation on all on those little Revolutionary Orthodox Coptic kids running around Piazza Plebiscito last week. (Feb 12) Of Confetti & Coriander. 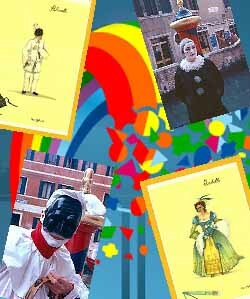 Today is Mardi Gras, the beginning of carnevale. (For earlier entries on that festival, see the items above this one). I take this opportunity merely to point out an interesting bit of language confusion. Most cultures that celebrate Mardi Gras usually get around at some point to throwing little colored bits of paper in the air or at one another all in good fun. Most languages use the Italian word, confetti, for these paper bits. It is true that the word is Italian, but it means something else. In modern Italian, confetti (plural of confetto) refers to the sugar-coated nuts (generally almonds) that are distributed on festive occasions, commonly on weddings. The tradition is medieval; apparently people used to throw the candies at the bride and groom and at each other, again all in good fun, of course. At weddings today, it is customary for the bride to pass out (no, not pass out, although you never know)...to hand out the candies to the guests. 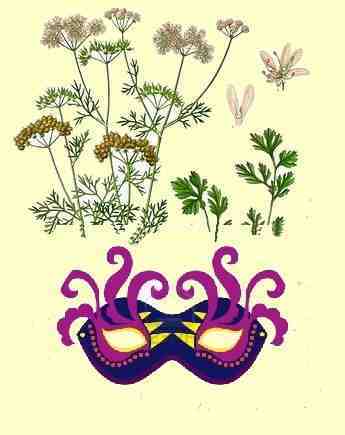 The modern Italian word for those festive bits of colored paper, however, is coriandoli, from the coriander plant (seen in the image, right). The confusion probably arises from the fact that in the Middle Ages the coriander seed was originally used instead of almonds as the center of the sugar-coated candy. The confusion is increased by the fact that in the Middle Ages, people used almost any festive occasion to throw things at each other—candy, rice, oranges, rotten eggs, rocks, dwarfs, etc. In modern Italy, the manufacture of both confetti (candy) and coriandoli (paper bits) is still big-time business. All parts of the coriander plant are edible, and 100 g of coriander will provide you with 9400 IU of vitamin A, among many other nutritional benefits. Colored bits of paper are also edible.